Teeth can break down for many reasons. Although everyone is familiar with tooth decay, it is only one part in the determination of biomechanical risk. Decay has traditionally been considered a simple process caused when plaque (a bacterial colony) on the tooth surface was exposed to sugar. Over a period of time acids generated by the plaque weakened the enamel surface, eventually leading to a cavity. Today we realize that this process is much more complex and is actually affected by many other factors. Many prescription medications cause a decrease in salivary flow and dry mouth, which seriously compromises the body’s ability to flush the mouth of food and debris, buffer mouth acids, and remove plaque from the teeth. Some systemic diseases, like bulimia and gastroesophogeal reflux (GERD), increase mouth acidity, as do a wide variety of popular beverages. The acids literally melt away the tooth structure and can quickly and severely destroy the teeth. The aging of our population and increased life span also increases the risk for tooth breakdown. Exposed root surfaces, more common as we age, are softer than enamel and therefore more cavity prone. Teeth are enduring eight and nine decades of chewing forces, thus making them more subject to wear, fracture and decay. Extensive prior dental work can result in weaker teeth, without adequate tooth structure to support needed restorations. Individuals who have multiple areas of decay, large fillings, or have lost teeth in the past due to lack of tooth structure are at higher risk for future breakdown. These individuals may need further investigation to eliminate the cause of their susceptibility, including dietary monitoring, salivary flow examination, and acid level monitoring. 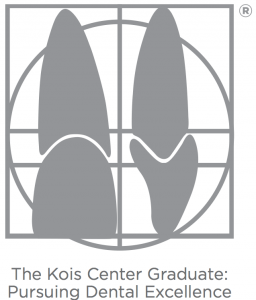 Once the risk level is known, a Kois-trained dentist will determine why the risk is elevated and develop a plan for eliminating or reducing the factors that may result in continued breakdown. Prevention of future decay may be accomplished by using the most effective forms of fluoride or anti-bacterial rinses. When consumption of sugary foods, soft drinks or other acidic beverages contributes to risk, dietary counseling and modification may be indicated. Management of systemic problems can be coordinated with an individual’s physician. When decisions are made to restore teeth, the biomechanical risk is minimized by conserving, or keeping, as much tooth structure as possible. Many new materials and techniques can be quite conservative. This minimizes trauma to the nerve inside the tooth, decreasing the chance that the tooth will need root canal treatment in the future. Sometimes, despite the best that dentistry has to offer, a tooth will simply be too weak to predictably restore and is best removed. Fortunately, dental implants offer a reliable replacement for missing teeth as they do not decay and can be part of a strategy to reduce the risk of future problems.